HM Journal Issue 04 ACW 72nd PA "Baxter's Fire Zouaves"
The 72nd Pennsylvania served all of its time in the Army of the Potomac and was involved in these major actions: Peninsula campaign Mar to Aug 1862; Second Bull Run (covering Pope's retreat) Aug 1862; Maryland campaign and Antietam Sep 1862; Fredericksburg Dec 1862; the "Mud March" Jan 1863; Chancellorsville May 1863; Gettysburg Jul 1863; the Summer 1863 stalemate; Mine Run campaign Nov-Dec 1863; Wilderness May 1864; Spotsylvania May 1864; North Anna May 1864; Cold Harbor Jun 1864; Siege of Petersburg Jun-Aug 1864; mustered out at Philadelphia in August 1864. During all of these battles and campaigns the regiment lost 11 officers and 182 enlisted men killed or died of wounds and 2 officers and 69 enlisted men died of disease for a grand total of 264 war deaths. 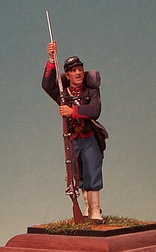 The 72nd Pennsylvania "Baxter's Fire Zouaves" initially wore an Americanized-French Chasseur uniform consisting of a French Chasseur-style dark blue jacket with three rows of small, ball buttons. The jacket was edged in double red trim around the collar, down the front, and along the bottom. There was additional edging around the cuffs. Trousers were sky-blue standard U.S. government-issue. When available, the men wore white leggings. The kepi was unadorned surmounted by the white clover leaf emblem of the 2nd Division of the 2nd Army Corps probably adopted and worn regularly by early 1863. There exists some doubt that the regiment was entirely outfitted in this uniform by the time of the Gettysburg campaign when a standard U. S. government five-button "sack" coat was probably more common by this time. 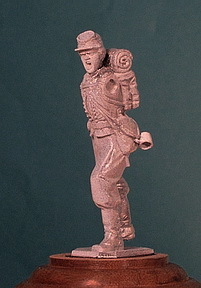 The figure chosen to make a "Fire Zouave" is a special issue 14th Brooklyn casting in a running position as shown in Figure 1 on the left. The casting on the right in Figure 1 has been modified to a "walking" position and will have a tin cup added. Figure 2 shows the primed casting with attached tin cup mounted on a base and ready to paint. In this case, the base material has been cut away to fit the display area on the top of the base. This rough area will be filled with super glue and dirt. At the end of the process, the dirt might be augmented by a sprinkling of "red earth" and static grass. Figure 3 shows what I paint first: the face, a thin liner around the bottom of the kepi and the top of the jacket collar, the shirt a liner to separate it from the jacket. The jacket is then painted a dark blue which is a mix of water-based paint either Andrea or Vallejo. The principal color is Prussian Blue to which is added black and violet. I don't mix this on my palette; I premix the color in a large batch, bottle it, and keep it handy. Often I have to do a lot of touch-up so I prefer to have a pre-mixed bottle on hand. The trousers are painted in Andrea ANAC54 (new ANXC24) Union Blue. The leggings are first done in white then washed in a mix of mostly white with a little Vallejo VC0988 Khaki. The rolled blanket is done in Andrea ANAC19 (new ANXC21) Medium Grey and then washed with a thin mix of black and brown (which are the basic colors for my pre-mixed dark brown liner). Figures 3 and 4 show a finished "Fire Zouave" ramming home a cartridge. It too is made from an unissued 14th Brooklyn figure with different arm positions and head. I try to mix up the color of the canteen and have seen a number of shades even some that come close to a medium blue olive drab. Blankets would often be in different shades. I speculated on the "72" on white on the haversack. It could have been "72 Pa" or "72 PaV" (the "V" for volunteers). There are a number of other variations incorporating the "Baxter's Fire Zouave" name. Details of the uniform are simple except for painting the looped cuff in double red trim. Three brass buttons fit into the looped cuff trim. The white 2nd Army Corps device is simply three dots of white with a white stem. Only the kepi and jacket are unique. There is no cuff trim and only a double row of light blue trim around the jacket, the inner one ends in the trefoils with the outer one slightly wider. The kepi has a dark blue base, red crown, and dark blue piping shown to best effect in Figure 4, above. 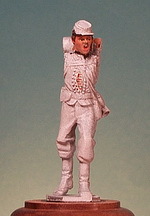 The Osprey source listed below shows an 72nd Pennsylvania enlisted man as figure 1 on Plate I.
American Civil War Zouaves, Osprey Elite #62, by Robin Smith, illustrated by Bill Younghusband, Osprey Publishing, Oxford, UK, 1996.